Hi friends! I hope you are having a good day! We had lunch and a play date with friends today which was just a much needed break from our regular routine and we had a great time! Tomorrow, Brady goes back to school. Ack! Let's see how that goes. Keep your fingers crossed for me! 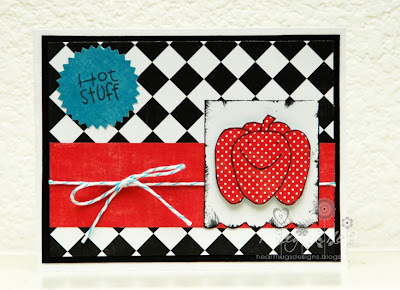 Here's a card I made with some fun Paper Smooches stamps. I don't know what it is about these veggies but I LOVE them!! I used some BRAND NEW Echo Park Happy Days paper that fell into my hot little hands. :D This is a great line for guys! I love the retro fun feel! Love that paper smooches stamp, and the sentiment too. I really like how you paired it with the diamond background paper. LOVE that paper pieced pepper...so CUTE! Cute! The colors are fab! I heart Paper Smooches! Love the diamond b&w pattern with the colored pp! !